Sarah Hotchkiss, In Circulation: World Report, 2017. SAN FRANCISCO – For the San Francisco Arts Commission’s final Summer of Love-themed poster series, Sarah Hotchkiss takes viewers beyond the ubiquitous images of long-haired hippies, dancing in Golden Gate Park with flowers in their hair holding peace signs. Her series, In Circulation, highlights the many diverse Bay Area political, cultural and social scenes of 1967 as seen through a host of both mainstream and underground publications. 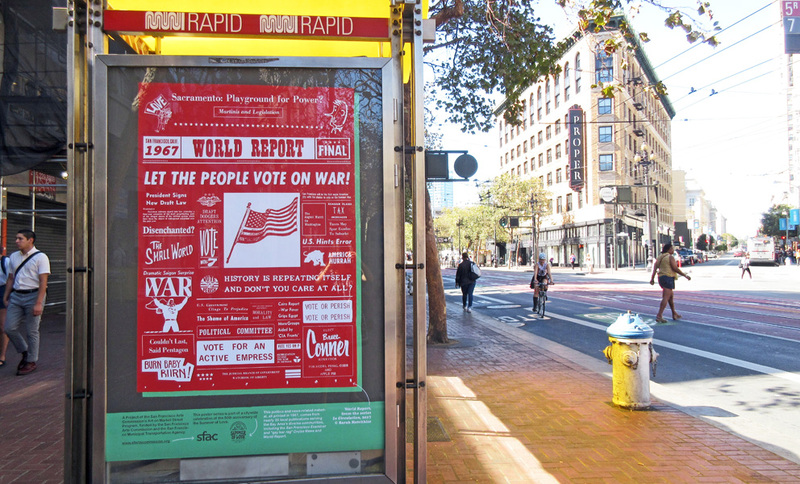 On view through January 12, 2018 in the bus kiosks along Market (between the Embarcadero and 8th Street), the posters compose a more inclusive and uncensored view of the other counterculture groups making waves during the Summer of Love. In her quest to “seek out the ‘true’ images of the Summer of Love,” Hotchkiss steeped herself in local printed media. She poured over not just the Haight Ashbury Free Press, but also the San Francisco Chronicle, the Berkeley Barb, the Black Panther’s Black Community News Service, and LGBTQ publications, including the Society for Individual Rights’ magazine Vector and the Daughters of Bilitis' The Ladder. Repurposing and combining headlines, illustrations and graphic elements from these diverse outlets, she reconstructs a new “multifaceted and contradictory” newspaper divided into six “sections” organized around specific themes: News, Ads, Arts, Food, Sports and Personals. There are six distinct posters in the entire In Circulation series that repeat six times along Market Street.